We lost our Rottweiler mix, Lucy, three years ago and while she will always live in our hearts, there are plenty reminders of her still around the house. Lucy suffered from severe separation anxiety. Crating wasn’t an option as that made her even more nervous, so we did what we could to dog proof the house. I dreaded coming home from work every day because I never knew what to expect. It could be curtains or blinds ripped from the windows, chewed floor molding, ripped up rugs, holes in the walls around the doors and windows, or all of the above. I will never forget the frantic look on Lucy’s face when I returned home. Her eyes were huge and she was panting like she had just come back from a strenuous hike. I often wondered what our border collie, Jason, must have thought as he watched his “sister” going through these episodes. 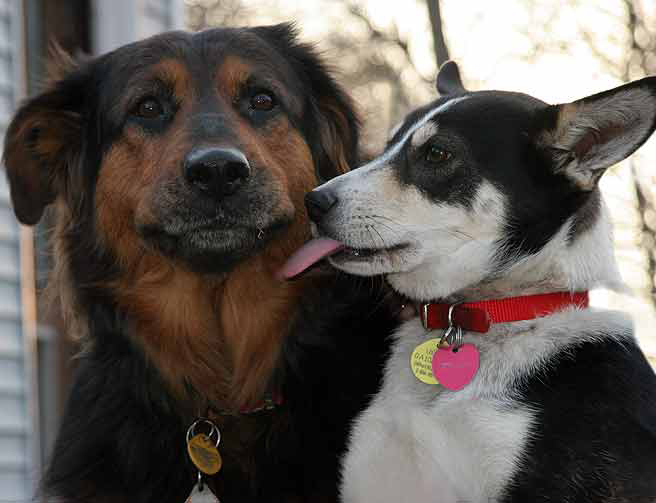 So often he tried to calm her down by licking her mouth and she seemed to enjoy that. 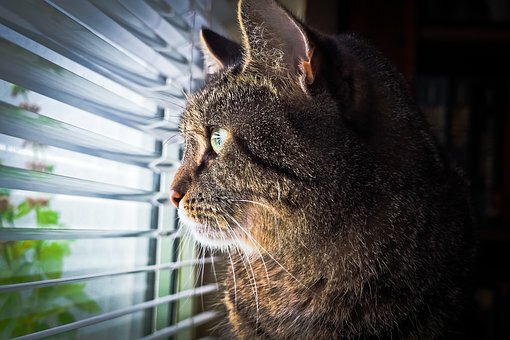 Dogs are not the only pets to suffer from separation anxiety, cats can also become stressed when left home alone. Behaviorists don’t fully understand why some pets suffer from this ailment while others don’t, but there are some triggers that can make susceptible pets anxious. Those include pets used to human companionship suddenly finding themselves home alone, a change in the family’s routine, or the loss of a family member or another pet. The most common symptoms in dogs include excessive barking, destructive chewing, pacing or accidents around the house. Cats may stop eating, yowl, scratch at the door or eliminate inappropriately. Since these behaviors could also be signs of a health issue, experts advise a trip to the veterinarian as the first line of defense. 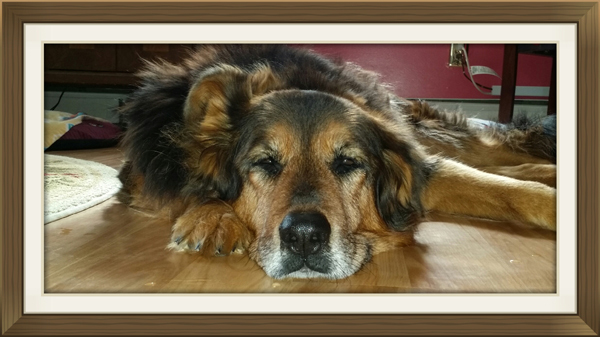 Following Lucy’s check-up with our regular veterinarian, we discovered that she was in a lot of pain due to arthritis. She was put on pain medication but that didn’t stop the intense anxiety when we left the house. Following a meeting with a veterinary behaviorist Lucy was put on anti-anxiety medication. She was still anxious when we left but it took the edge off and she stopped the destructive behavior. When a health issue is ruled out, it’s important that families not misunderstand an anxious dog’s behavior. Despite what many pet parents believe, a dog is not causing destruction in the home out of spite because the family left. The dog eliminates inappropriately because he is anxious and chews because it helps to relieve stress. When dealing with anxious animals departures to and from home should be uneventful.There should be no long goodbyes. Just give the dog a treat or a toy and leave. Upon returning home don’t immediately begin to make a fuss of the dog. Only pay attention to the dog after he/she calms down. Use sit, down, and stay exercises to help dogs get comfortable in a room by themselves even when the family is home. Confining an anxious dog in a crate will only add to his/her stress. To help make cats comfortable when home alone create a stimulating space. For example, place a cat tree by a window where the cat can look outside. Also consider using food dispensing toys, soothing music or DVDs made especially for cats to help entertain kitty when home alone.